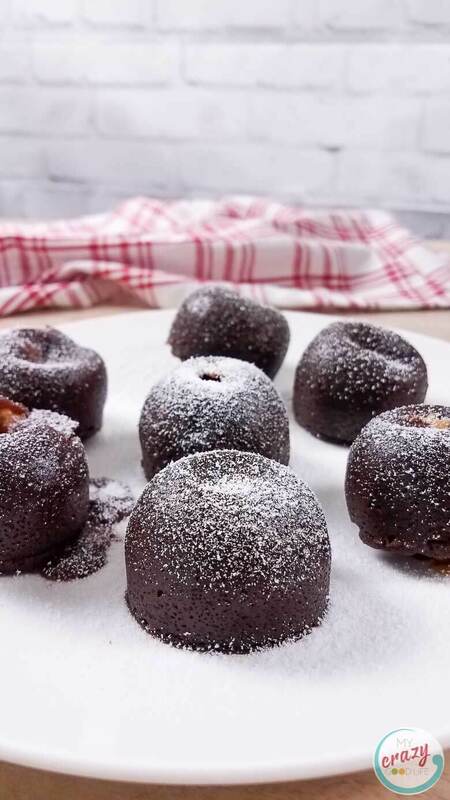 These Instant Pot Chocolate Peanut Butter Lava Cakes are a delicious healthy dessert recipe. 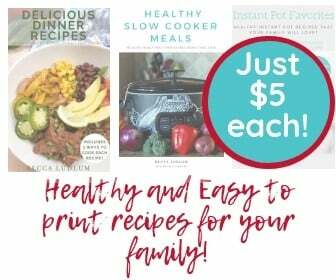 Made in the Instant Pot with egg bite molds, this is an easy clean eating recipe that satisfies your sweet tooth! Optional coconut whipped cream recipe included, of course. What is a Peanut Butter Lava Cake? Heaven, actually. It’s a delicious chocolate lava cake that is filled with peanut butter instead of chocolate. As someone who doesn’t love chocolate (but loves peanut butter), this is is pretty much my favorite idea for a dessert. Also called Molten Lava Cake, this is made with honey (you could also use maple syrup), dark chocolate chips, and brown rice flour (making it gluten free). This recipe isn’t dairy free because of the butter and dark chocolate chips it includes. I consider these clean eating lava cakes because there is no refined sugar added, only the sugar contained in the dark chocolate. Also, it has a limited amount of dairy and no gluten. Using organic peanut butter with no palm oil makes this a healthy dessert recipe that your entire family will love. I’ve got directions below for this lava cake in egg bite molds (or silicone molds). 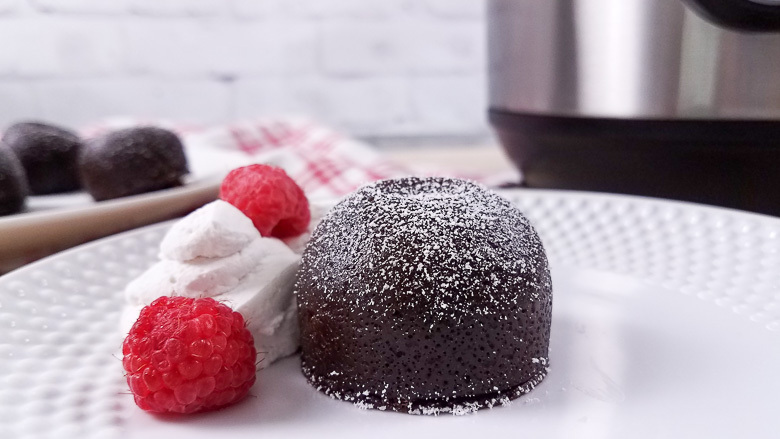 They make perfect-sized lava cakes in the Instant Pot. 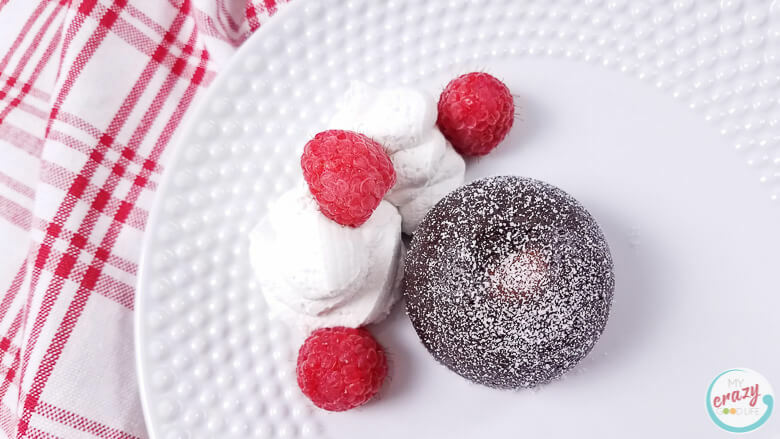 If you’re looking for a traditional Instant Pot chocolate lava cake recipe that is healthy, take a peek at this recipe. 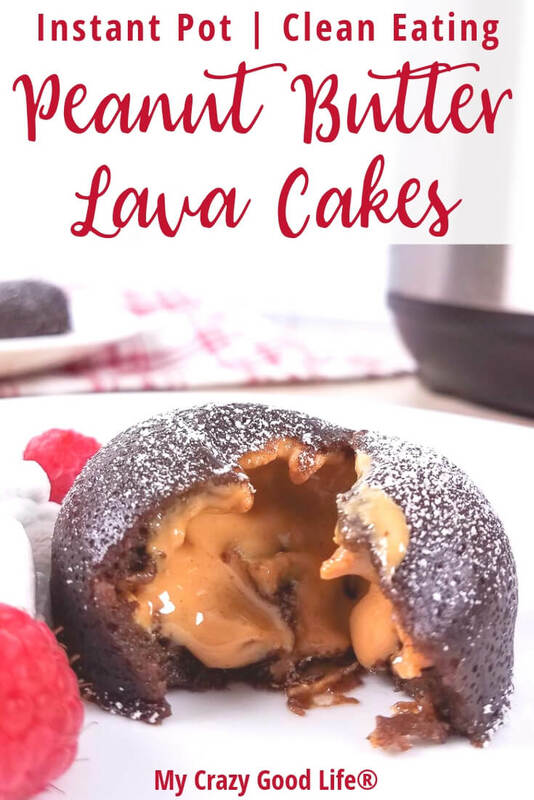 The cooking directions for my traditional recipe can also be used if you don’t have egg bite molds–just add peanut butter to the inside of those lava cakes and then follow the Instant Pot cooking times. Making the perfect lava cake is all about timing. You want to make sure the cake is cooked, but the inside is not. And also, avoid the temptation to cut one open before serving because the filling will come out. I highly recommend making these before serving them to company to make sure your cooking times are perfect, as some Instant Pots cook differently. Is this a Keto Peanut Butter Lava Cake? I would not consider this keto. At 12 net grams of carbs per cake, this is a fairly low carb dessert but not a keto dessert. 1) In a large bowl, add the butter and dark chocolate (you can use semi sweet if you’re not concerned about the extra sugar). Melt the butter and chocolate in the microwaves in 30 second ingredients, until the butter and chocolate are melted. About 1 minute. 2) Using a bowl whisk, mix together to butter and chocolate. Then add eggs, coconut milk, brown rice flour (you could also use whole wheat), salt, honey, baking powder, and cocoa powder (everything except the peanut butter). Mix the batter until smooth. 3) Grease each cup of your silicone egg bite mold. Once the cups are greases fill each cup half way with batter. 4) Add a tsp of peanut butter to the center of each cup, then fill the cups with the remaining batter. Each cup should be 3/4 of the way full. 6) Add 1 cup of water to the bottom of the Instant Pot insert. 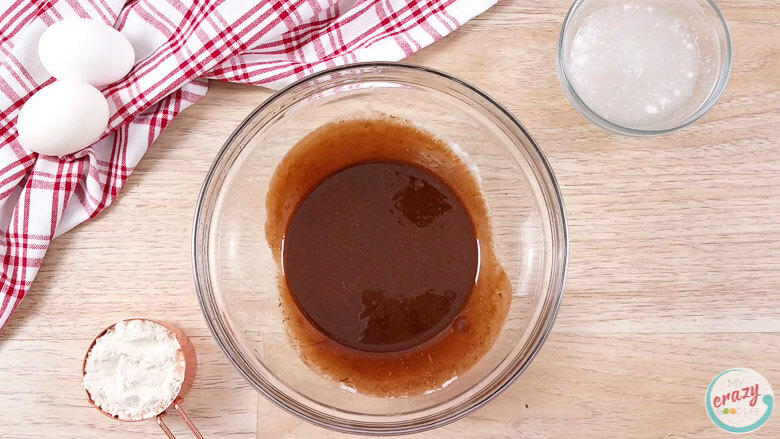 Use the handles of the trivet to lower the lava cakes into the Instant Pot. 7) Close the lid and turn the pressure valve to sealing. Cook the cakes on high pressure using the manual button for 5 minutes. As soon as the Instant Pot beeps that the timer is done, manually release the pressure and remove the lava cakes from the Instant Pot. 8) While the cakes are still hot, remove the foil and run a spoon around the edge of each cup to loosen the cakes. Place a plate over the top of the lava cakes and then flip them upside down to remove the cakes. Sprinkle with powdered stevia (optional) and serve immediately with a side of coconut whipped cream and raspberries. 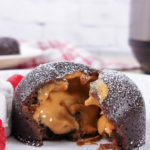 What should I serve with these Peanut Butter Lava Cakes? As I mentioned above, I prefer to serve these with fruit and maybe coconut whipped cream. Some like to serve them with ice cream but unless I’m having a cheat day I try to stay away from ice cream and items with refined sugar in them. Powdered Stevia gives these a nice sweet taste, as would some coconut palm sugar. If you want to step outside the box a little, I’d totally serve these with bananas! I think the chocolate, peanut butter, and banana combo would pretty pretty amazing. *Note: Stick your can of coconut cream in your fridge as soon as you get home from the store so you can use it for this whipped cream recipe! 1) Open the can of coconut cream and separate the milk from the cream. The cream should be hard and the milk watery. 2) Place the cream in a chilled bowl. Add the stevia. 3) Whip the coconut cream with a hand mixer for 1-2 minutes until the coconut cream is soft and has a whipped cream like texture. 4) Store in the fridge until ready to use, but the same day. It will not keep in the fridge for longer than a day. I love this whipped cream dispenser for my homemade whipped cream–it’s so easy to use and I love the way it looks (especially when company comes over!). The presentation of a dessert isn’t super important to me, but I feel like this whipped cream dispenser is easy and fun to use. You could easily make raspberry whipped cream or any other flavor–key lime is so delicious. As you can see in my picture above, it’s tricky to get them all to turn out perfect. Lots of spray oil helps (I usually use coconut oil spray), as does not waiting for them to cool before you remove them from the molds. I like to make these while we are eating dinner because of the struggles I’ve had with removing them from the egg bite molds. A broken chocolate cake looks much more beautiful when it’s right out of the pressure cooker and still warm. Why aren’t my Lava Cakes cooked right? If your Instant Pot lava cakes are too gooey or look as if they’re overcooked, it could be because of several reasons. If your lava cakes are too gooey, you should cook them for a minute longer next time you make them. Right now, put the cakes back into the pot and close the lid for 1-2 minutes. Don’t turn the pot on–it should still come to pressure quickly and finish cooking your lava cakes. If your lava cakes are overcooked, pull them out of the molds as soon as you can and eat them immediately. Five minutes in the pressure cooker was perfect for my cakes, so I don’t think you’ll have this problem. If this is an issue, reduce the cook time by one minute next time you make them. Are these Lava Cakes ok to eat on the 21 Day Fix, Ultimate Portion Fix, 2B Mindset, or Weight Watchers? One of these lava cakes are considered a treat swap on the 21 Day Fix and Ultimate Portion Fix. At just over 200 calories each, they’re slightly over what I’d like to see for a treat swap but if you’re not eating these three times a week you should be ok ;) Each cake (without toppings) is 8 Freestyle SmartPoints, and for 2B Mindset this is considered a silly carb for sure–track it and see. Are you looking for more healthy recipes to make in your egg bite molds? In a large bowl add the butter and dark chocolate. Melt the butter and chocolate in the microwaves in 30 second increments, until the butter and chocolate are melted. About 1 minute. Mix together to butter and chocolate. Then add the remaining ingredients except the peanut butter. Mix the batter until smooth. 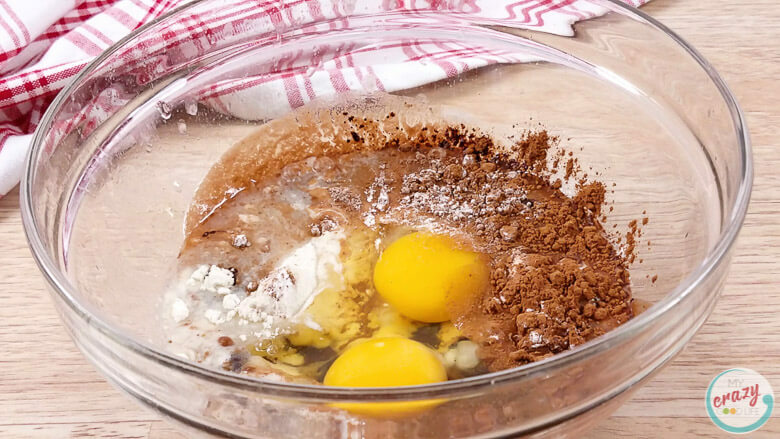 Grease each cup of your silicone egg bite mold. Once the cups are greased, fill each cup half way with batter. 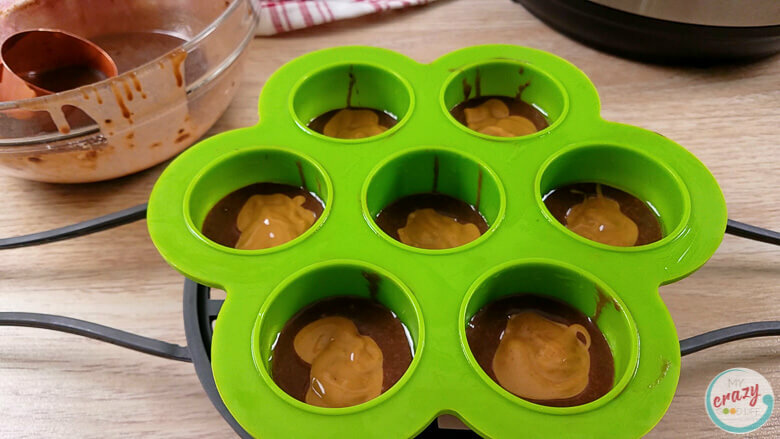 Add a tsp of peanut butter to the center of each cup, then fill the cups with the remaining batter. Each cup should be 3/4 of the way full. Cover the silicone mold with foil and place the mold on a trivet. Add 1 cup of water to the bottom of the Instant Pot insert. Use the handles of the trivet to lower the lava cakes into the Instant Pot. Close the lid and turn the pressure valve to sealing. Cook the cakes on high pressure using the manual button for 5 minutes. As soon as the Instant Pot beeps that the timer is done, manually release the pressure and remove the lava cakes from the Instant Pot. While the cakes are still hot, remove the foil and run a spoon around the edge of each cup to loosen the cakes. Place a plate over the top of the lava cakes and then carefully flip them upside down to remove the cakes. Sprinkle with powdered stevia (optional) and serve immediately with a side of coconut whipped cream and raspberries. Open the can of coconut cream and separate the milk from the cream. The cream should be hard and the milk watery. Place the cream in a chilled bowl. Add the stevia. Whip the coconut cream with a hand mixer for 1-2 minutes until the coconut cream is soft and has a whipped cream like texture. Store in the fridge until ready to use, but the same day. It will not keep in the fridge for longer than a day. I am so in love with these cakes! Delicious!!! I am in love with this recipe! Thank you for such an awesome (and healthy!) treat for my family. I need to start making more desserts in my Instant Pot, and this looks like the perfect recipe to start with! Thanks so much for sharing! Those look crazy delicious! Thanks so much for sharing! Hi, my daughter has a peanut allergy. Do you think sun butter would work?